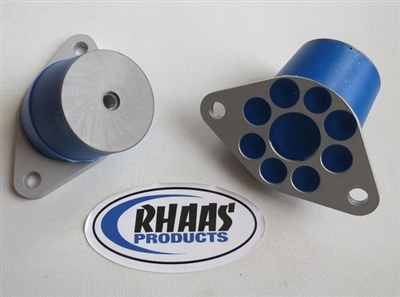 These mounts are made from 6061 anodized aluminum for corrosion protection and a long life. The urethane is co-molded into the base and the threaded insert to provide a one piece, mechanical lock on all components. These mounts do not rely on glue to hold things together, the mount is molded at one time with the billet threaded insert and the billet aluminum base. These are made to the highest standards in our own manufacturing facility right here in the USA. There is 4 years of R&D that went into making these mounts. Also available in shorter versions for special applications. I have ran these mount for 2 years and mostly surf ride. They are the first set of mounts that I have used that has lasted that long. and to top that you can not beat the warranty.